As many Arizonans travel to San Diego for the Memorial Day weekend, I’m reminded of the trek of US Army General Stephen Watts Kearny. General Kearny departed for San Diego from New Mexico in November of 1846, passing through the “Copper Basin” area of Arizona along the Gila River Trail, wherein now lies his namesake town of Kearny in Pinal County. 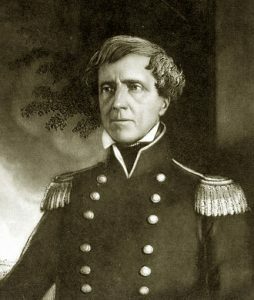 With the Mexican-American War having broken out after US annexation of the Republic of Texas, Kearny undertook the journey to the West Coast to help take control of California. Kearny’s column of dragoons (light cavalry) was joined by Kit Carson; and by sailors and Marines dispatched by Commodore Robert F. Stockton; and soldiers from Lt. Col. John C. Frémont‘s California Battalion. These troops engaged 150 well-trained CalifornioLancers under command of Andrés Pico (brother of Californio Governor Pio Pico) on December 6, 1846 near present-day Ramona, California, on rain-soaked ground unfamiliar to the US forces. Kearny’s men were eventually surrounded by Pico’s forces on a hilltop position. However, when their gunpowder dried, they were able to drive away the Lancers. With additional reinforcements from San Diego, Kearny was finally able to withdraw there. The 17 casualties of the Battle of San Pasqual were buried in a mass grave on the battlefield. Historically, Battle of San Pasqual is viewed as a mixed result, with neither side being clearly victorious. But, in January of 1847, Kearny’s troops, Stockton’s men, and Frémont’s soldiers recaptured Los Angeles, hastening the end of the conflict in California. Kearny later became governor of California. Kearny’s causalities from San Pasqual were ultimately reinterred in 1882 at what was originally the one-acre Post Cemetery for the War Department’s San Diego Barracks. With the construction of a sea coast artillery battery, San Diego Barracks was renamed Fort Rosecrans, for Union Civil War General William Starke Rosecrans. The brilliant career of Rosecrans would be colored by defeat at the Battle of Chickamauga. But after retirement, Rosecrans would serve as a US Congressman representing California. The San Diego Barracks Post Cemetery was incorporated into the Fort Rosecrans Post Cemetery, which became the eight-acre Fort Rosecrans National Cemetery in 1934. 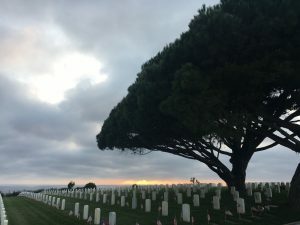 But the Post Cemetery remains as the stone-walled “Post Section” of the National Cemetery, where Kearny’s fallen troopers are surrounded today by 112,000 of their fellow veterans in their now-82-acre resting place overlooking San Diego Bay and the Pacific Ocean to the west.